Minor Quirks: Outlook 07 10 13, Lotus Notes 8, People using Internet Explorer in webmail. Testing: Unfortunately I only have iOS devices to test on. If you test it on an android device let me know your results. Here's a quick demo showing the magic! There are essentially three things that makes this trick work: Overflow:hidden, min-height, and max-height. First we create a <div> which will contain our image and our new alternative text. We then add our img and our table which holds the alternative text we want to appear when images are turned off. You don't have to use &nbsp; you can put something like 'Images are disabled' if you wish. There has to be some kind of text to prevent IE from pushing your Alternative text out of the min-height area. That's it, you're done! This will now work in desktop clients. Getting this trick to work on mobile clients is pretty straight forward, we just need to adjust and add some css properties to the classes we added in the HTML markup. Next we position the Alternative text on top of the hero image. 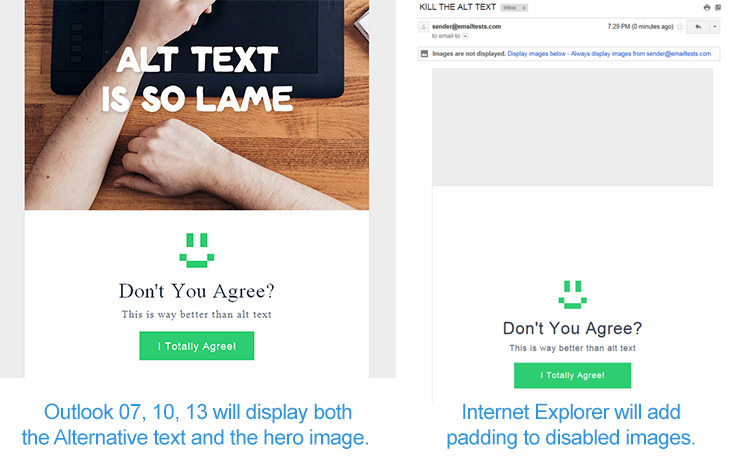 The top value is based on the distance from the top of the email to the top of the hero image + 10px for some extra padding. The previous styling will display our Alternative text above our hero image. We need to set it to position:relative and set it's z-index. Tada! We now have this working in mobile devices. To get this to work in gmail I used an image guide to control the scaling of gmail app. There are a few quirks that may turn you off from this trick, Below are screenshots. For Outlook you can wrap your alternative text with a conditional statement to hide it but nothing will display when the email is loaded without images. Grab the code from CodePen. You could use conditional comments to hide the fake alt text from Outlook if you wanted. Can we have an example of how it would look like with the conditional comments in as well? One thing to note is if you do this, nothing will display in outlook 07, 10, and 13 until images are turned on. Personally I'll take duplicate copy over nothing being displayed with images off. Thanks, in my case, I need to design the email starting from a .psd, I cannot alter the design, so duplicate copy is a no-no. This now works everywhere except Lotus Notes 7. Its just an awesome idea I must say. Thank you sharing this with us.